SPBTLE-1S module is based on the BlueNRG-1 component. For developing on the SPBTLE-1S module is necessary use the STSW-BLUENRG1-DK. 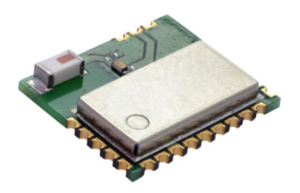 STSW-BLUENRG1-DK is evaluation SW package based on the BlueNRG-1 and BlueNRG-2 very low power Bluetooth low energy (BLE) single-mode systems-on-chip with 160 KB and 256 KB of Flash memory, respectively, 24 KB of RAM, 32-bit core ARM® Cortex®-M0 and ADC, GPIOs, I²C, RTC, SPI, Timers, UART, WDG and RTC peripherals. The STSW-BLUENRG1-DK SW package contains a complete set of peripheral drivers (header and source files), which allow interface with the device peripherals (ADC, GPIOs,I²C, RTC, SPI, Timers, UART and WDG, RTC), and a complete set of related demonstration applications (header and source files).